Some say it’s “like farting in your own air cylinder”. Others suggest “it’s like plumbing the sewer into your drinking water”. Then there’s the one that reckons “it’s the same as re ingesting your own vomit”. Either way, I reckon you get the drift that none of the above examples are particularly palatable and most unhygienic! Same goes for what’s going on with directing oily fumes back into your engine. If you haven’t cottoned on to what we’re jabbering on about; our late model, common rail diesel engines have one major fault (there are other minor faults with some models too) in that the spent gases and dirty fumes must be redirected back into the engine; often via inlet manifolds, turbos and intercoolers – yep piping dirty, oily gases back into what should be kept free from oil and sludge. Theoretically, there should be only be dry soot flowing through these pipes, but it’s the oily fumes that turn that soot into sludge, which in turn blocks up everything that it comes in contact with. Why? It’s all in the name of cleanliness – not for the engine but for the environment. It seems those desk-grinders that make the emission rules have deemed that it’s OK to bugger an engine for the sake of keeping the air pollutants down. Now, don’t get me wrong; I’m all for keeping our joints air clean, but surely there was a better way to achieve the results without damaging the internals of our modern, powerful, efficient and extremely expensive engines! Enter the aftermarket industry that designed what in essence is an extremely simply fix – the Catch Can. While there are other derivatives of what is, or should be a, simple process of filtering out the damaging dirty fumes that enter your engines inlets, the Flash Lube Catch Can Pro has been developed to offer more protection with the inclusion of pressure relief and vacuum relief valve so as not to over-pressure the engine which could lead to other failures. The Flash Lube model also features free-flowing large-diameter inlet and outlet ports of 19mm (notably the same diameter pipes as on my engine), a replaceable filter, a rotating head to aid in fitting and is all compact enough to fit into most overcrowded engine bays. Given the filtering of the dirty oily gases; the catch can will ensure your inlet manifold stays clean, prevents your intercooler and turbo from clogging up with oil and gunk and also keeps sensors clean to enable them to perform as designed. For my installation on the TDV8 Troopy, fitting the Catch Can Pro was a simple process of intercepting the airline going from the tappet cover to the air intake hose (which goes from the air filter to the turbo), installing the catch can in line and mounting it next to my battery – easy as pie! 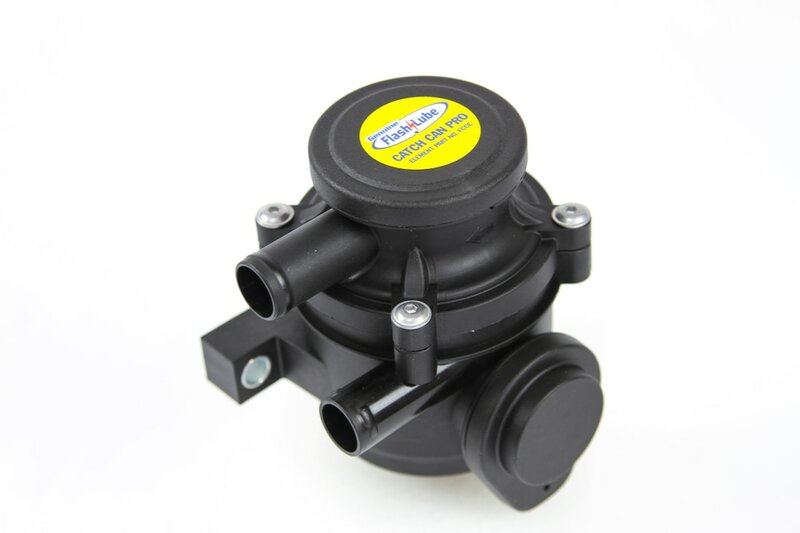 Once installed, the Flash Lube Catch Can Pro filters the fumes via the airflow passing through the inbuilt replaceable filter and allows clean air to pass into the turbo, intercooler and inlet manifold then into the engine which satisfies all emission controls. Not that mine has been installed long enough, but the kit comes complete with a drain hose and tap (which I’ve installed directly below the Catch Can Pro on the chassis rail) which allows easy drainage of the captured oil (from the Catch Can) into a container for proper disposal. This can be done at regular service intervals and should only take a minute or two to complete. Another advantage of capturing that waste oil is that (over time) if you find more oil in the can that normal, then something might be amiss with your engine. While I didn’t make the Flash Lube Catch Can Pro top of my aftermarket list of goodies, in hindsight, I should have as keeping the internals clean and as free flowing as possible aids in overall performance. Long term, keeping all that gunk out of where it should never have been pipped into can only be a good thing for your engine.